Here at Häfele, we’re proud to partner with world-leading brands that share our commitment for quality and innovation. One of our most recent partnerships to demonstrate this has been with Schuco, one of the leading suppliers of high-quality window, door and façade systems made from aluminium and steel. Our partnership with Schuco enables us to provide you, our customers, with solutions that bring this quality and innovation to your projects. The Schuco Smartcube does just that. 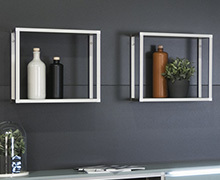 This innovative solution is the infinite shelving system, offering complete versatility to design and configuration. At the core of the Smartcube is a small cube that can be extended to suit various requirements, providing absolute flexibility, whether in residential living areas or corporate environments.